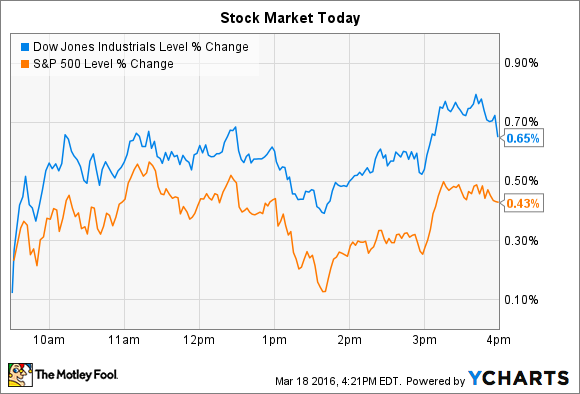 Find out why these two stocks beat indexes today. The stock market continued its rally Friday, adding to the impressive gains that investors have witnessed over the last few weeks. The Dow Jones Industrial Average (DJINDICES: ^DJI) climbed further into positive territory on the year by gaining 118 points, or 0.7%. The S&P 500 (SNPINDEX: ^GSPC) rose 9 points, or 0.4%. So far in 2016, the Dow is now up 1% -- after having dropped 10% by Feb. 11 -- and the S&P has gained 0.3% on the year. Individual stocks on the move included Starwood Hotels (NYSE:HOT) and Tiffany (NYSE:TIF). Rising 5%, Starwood Hotels was one of the biggest-gaining stocks on the S&P 500 on news that a bidding war may be breaking out over its stock. It has received a buyout offer that is better than what Marriott (NASDAQ:MAR) has bid for the hotel chain: Starwood investors are set to receive $78 per share in cash from a consortium of investors led by Anbang Insurance Group, compared to the mix of cash and stock from Marriott that's currently worth $71 per share. After reviewing the unsolicited bid, Starwood told Marriott that it intends to cancel their merger agreement and take the more generous offer . This story isn't over yet, though, as Marriott has a small window of time, until midnight on March, 28, to be exact, during which it can woo Starwood back with more cash and/or better deal terms. Marriot put out a statement today suggesting that it intends to do just that: The company "continues to believe that a combination of Marriott and Starwood is the best course for both companies and offers the best value to Starwood shareholders," executives said. Marriott also has a financial edge in this negotiation as it will receive $400 million from Starwood if the company decides to walk away from their deal . The likelihood for a bidding war has sent Starwood's shares up to $80, for a solid premium over the current highest bid of $78 per share. High-end jewelry retailer Tiffany rose in the wake of its latest quarterly earnings report that showed revenue falling 2% while net income declined to $187 million from $196 million last year. Both figures fell shy of management's expectations. "We faced various challenges during the year that negatively affected our financial results, especially related to the strong U.S. dollar," CEO Frederic Cumenal said in a press release . On the positive side, Tiffany's profitability spiked to 63% from 61% last year as input costs fell and as prices rose. That improvement helped gross margin rise by a full percentage point for the year, up to 61% of sales. The retailer also significantly ramped up its stock buyback spending, dedicating $104 million to that goal in Q4, compared to $116 million through the prior three quarters. Cumenal and his team don't see a quick rebound in selling conditions, and they forecast a year-over-year profit decline in each of the next two quarters, before growth is projected to return in the back half of the year. Longer term, executives are targeting healthy sales and profit gains as soon as the selling environment improves. "We are focused on returning to stronger financial performance, at sustainable rates, which we believe is achievable as we execute on our strategic initiatives and as challenging external conditions abate," Cumenal explained. Given the improving profitability and still-healthy cash flow that Tiffany is producing, it's not surprising that investors found reason to agree with management's optimism by erasing a portion of the stock's year-to-date losses today.